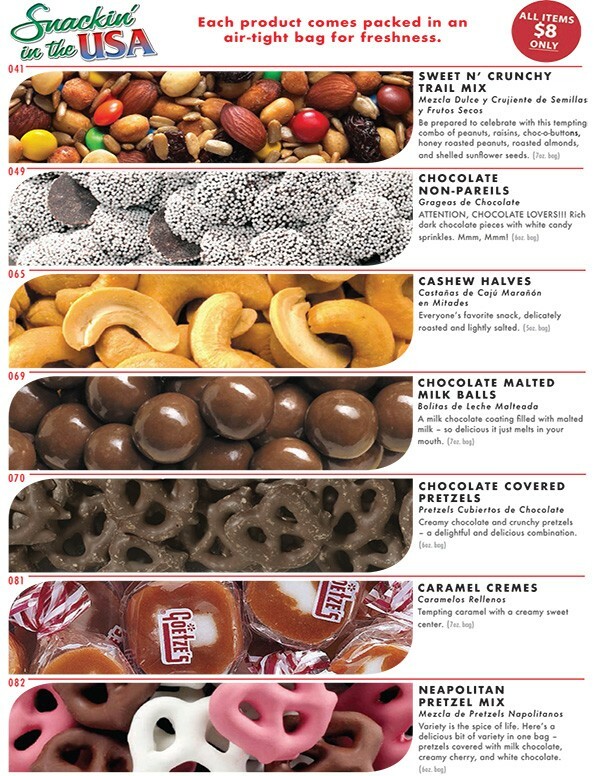 20 Delicious Choices: Chocolate Covered Almonds, Butter Toffee Peanuts, Hawaiian Delight, Gummi Bears, Neon Sour Gummy Worms, Mixed Nuts with Peanuts, Peanut Squares, Cashew Snack Mix, Sweet n' Crunchy Trail Mix, Chocolate Non-Pareils, Cashew Halves, Chocolate Malted Milk Balls, Chocolate Covered Pretzels, Caramel Cremes, Neapolitan Pretzel Mix, Gummi Fruit Slices, Honey Roasted Peanuts, Chocolate Covered Peanuts, Chocolate Covered Raisins, Cranberry Fitness Mix. FREE to Start: The Nuts About Sports fundraising program costs absolutely nothing to get started. Simply let us know how many fundraising participants you have and we’ll send 1 order-taker for each of them, at no charge. 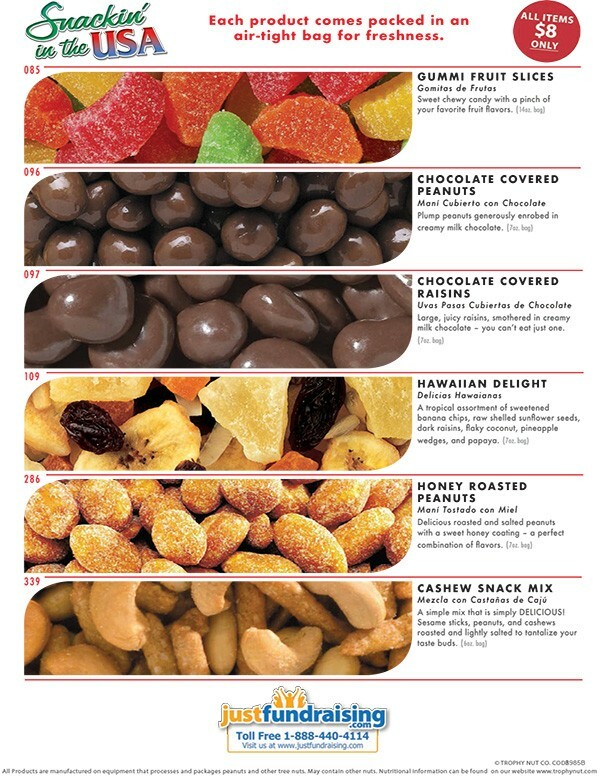 Priced To Sell: Only $8.00 per snack - you’ll find many supporters will buy 2 or more of their favorites. Free Shipping and No Minimums: Your group receives Free Shipping when you sell $1,000 retail or more of fundraising product. It's easy - a small group of 20 participants has to sell only 7 items at $8.00 each to get free shipping. And there are no minimums – just sell as much as you can! 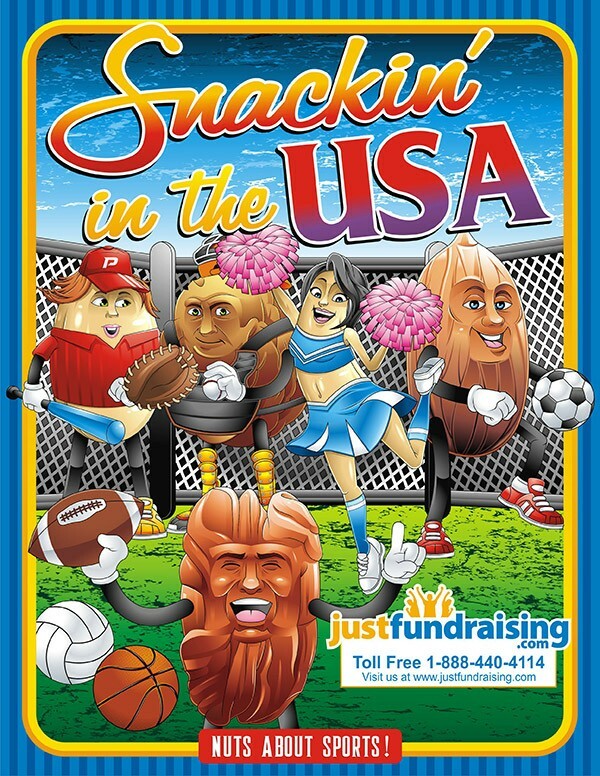 How Does the Nuts About Sports Fundraiser Work? 1. 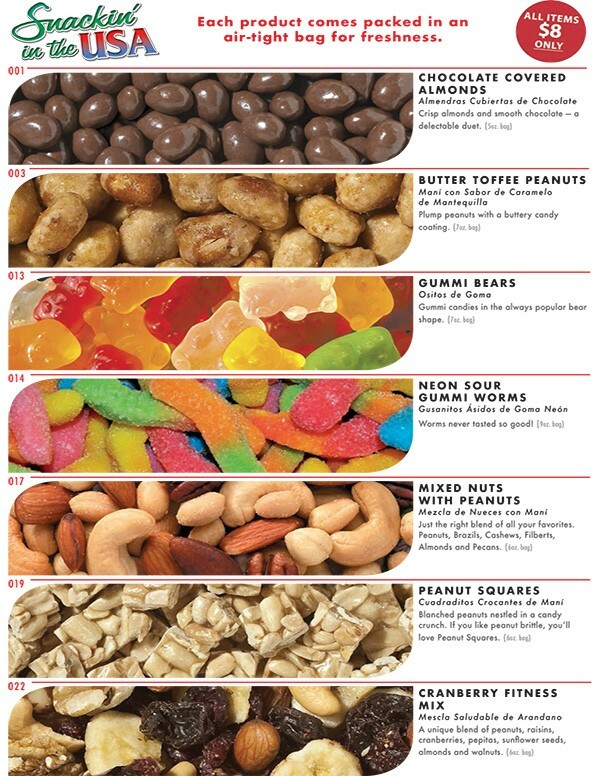 Order 1 Nuts About Sports order-taker PER fundraising participant – they’re FREE of charge! Our athletic department raised over $2000! Each sellers profit will go towards their student fees for the year.